Although most of my beading is done on my own at home, it is always nice to bead in company. 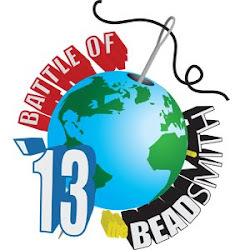 For the last two years I've attended a Bead Retreat with some like minded beaders in the Peak District of Derbyshire UK. This May will be the third such event (provided I manage to step into the capable shoes of Donna, and sort all the payments!). 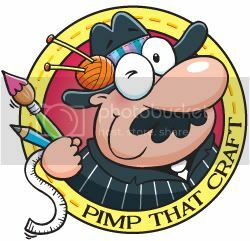 We don't have any organised classes, everyone works on different projects, and we are a mixture of seed beaders, wireworkers, stringers and lampworkers. Obviously the lampworkers don't bring their torch set up, but they do bring lovely examples of their wares to sell to the others. The central beads in the ring of pressed hearts finally made it into one of my beady projects 'Serpentina' previously featured in this blog! We also bring beads/beaded items for swapping, and exchange hints and tips, get beginners started, eat, drink and make merry! One of the best parts is leaving behind our various domestic duties and beading all day and late into the night...and not having to put the beads away! Sometimes I get the opportunity to bead with a friend, although many of my best beady friends and I interact mainly in the internet, and I don't get to see them in real life. This weekend, after two unsuccessful attempts, my friend Jo came over to play with beads. I persuaded my family to go to the cinema, and we took over the dining table for beading. Fabulous Jo has organised Laura McCabe classes in Norwich, although we had previously met on Internet forums, I first met her in real life at the class. This year we don't have the Laura classes here to look forward to, but will be travelling to Edinburgh together to take a class with Huib Petersen! Can't wait! Jo and I both worked on some freeform RAW based on the method of NanC Meinhardt in her Izzy and Lucy bracelet design, and with inspiration from Nancy Dale's Garnet Garden (my Christmas present from Roy...but I bought it myself as I admired it so much!) Jo's is in Wintry whites and mine in Autumnal shades, using as a base some seed bead soup which Nancy kindly sent me. I have a cute little goldstone Zuni bear to add to mine, now I'm onto the embellishment phase. Pictures soon I hope! I had loads of fun and the day just whizzed by (we did remember to stop for lunch though!) I hope we can do it again soon!